Can you check your plugins if your ping is 5 millionare. I am currently using this plugin with respawn_at_place.amxx to achieve above but it "portals" like 3 times to respawn after death. I tried setting spawnmode to none, -- etc, but it doesn't work. And using only respawn_at_place is not enough, because hit-box is messed up after respawning. 1. Bot remembers the position (including ducking) and aim upon first hit. So i can remove respawn_at_place.amxx and i can set "spawn_wait_time" lower than 0.75. It would be really nice to have that for wallbang training. I previously download BAILOPAN's version but some plugins not working. Today I will try yours. But when i say guns in server nothing hapens, when i respawn still nothing hapens, menu not show. I select 3 option to save my weapons. 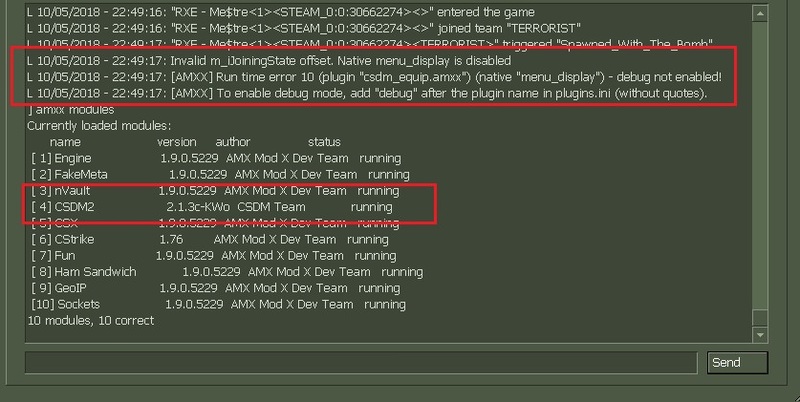 How can I completely disable the csdm_amxx.dll library? There is a function csdm_active 0, but when the server is restarted on another mod (for example, war3ft) is invalid. Can eat any else commands? Prompt. Thanks. How do I make that all weapons disappear after 1 second of dropping them but bomb stays on the ground forever when you drop it? L 10/05/2018 - 22:49:16: "RXE - Me$tre<1><STEAM_0:0:30662274><>" joined team "TERRORIST"
L 10/05/2018 - 22:49:17: "RXE - Me$tre<1><STEAM_0:0:30662274><TERRORIST>" triggered "Spawned_With_The_Bomb"
L 10/05/2018 - 22:49:17: [AMXX] Run time error 10 (plugin "csdm_equip.amxx") (native "menu_display") - debug not enabled! L 10/05/2018 - 22:49:17: [AMXX] To enable debug mode, add "debug" after the plugin name in plugins.ini (without quotes). Last edited by GBLTeam; 01-30-2019 at 14:25.